Compañeros and compañeras, we denounce that today, March 21, 2015 at around 8 o’clock in the morning more than 600 members of the public forces burned down our San Sebastián regional headquarters with the participation of the ejidal Commissioner Alejandro Moreno Gomez and the Security Adviser Samuel Díaz Guzmán. Once again the politics of death and the corruption of the bad government are demonstrated, and its contempt for the people and human rights because it seeks to achieve its ambition to get hold of our territory through the dispossession of the land, the water and everything that exists in our country, as if it were merchandise, in order to gain money. We hold the paramilitary chiefs peña nieto and manuel velasco responsible for the violence in San Sebastián Bachajón and for the human rights violations, death and repression of women and men in our organization who do not sell their dignity in exchange for their crumbs. We reject the tricks of the bad government to malign our struggle and fabricate crimes [and attribute them] to the organization which is defending the mother earth. Together with Alejandro Moreno Gómez the ejidal Commissioner and the Security Adviser Samuel Díaz Guzmán, they set up a roadblock on the road from Ocosingo to Palenque at the high point at the turning to agua azul in order to blame our organization for blocking the road, and also these lackeys of the bad government are cutting down trees and we know that they are fabricating crimes of ecocide so they can arrest the autonomous authorities of our organization. We disclaim [any link to] these actions organized and supported by the bad government, together with the ejidal commissioner, they are only looking for a way to bend the law so they can put us in prison and dispossess us of our territory for transnational projects which only benefit those from above. 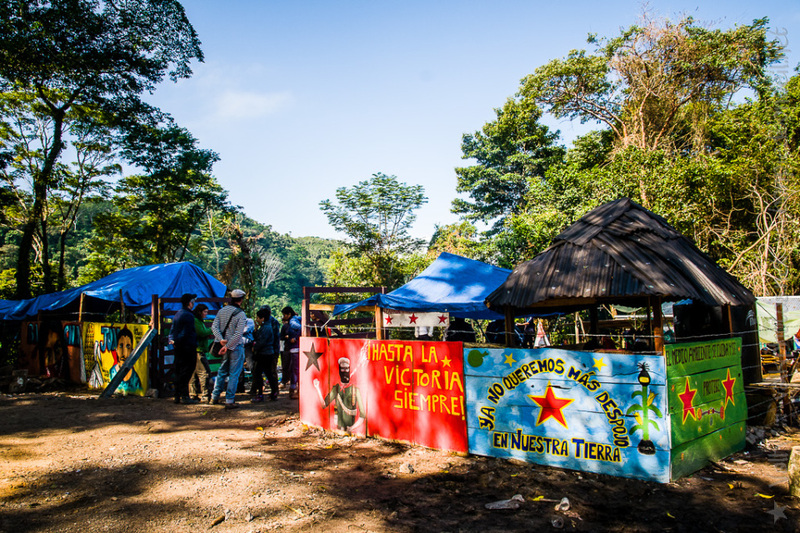 After the violent eviction of January 9, 2015, we in our organization established the San Sebastián regional headquarters to continue caring for the land and to demand the withdrawal of bad government, this is where we will continue because we are the original peoples of these lands and we will not allow the bad government to come to command the people. We remember today with dignified rage that it is a year since the killing of our compañero Juan Carlos Gómez Silvano, coordinator of the organization in the community of Virgen de Dolores, and next month will mark two years since the killing of our compañero Juan Vázquez Guzmán, secretary general of our organization, in whose memory the struggle in San Sebastián Bachajón continues. We demand the withdrawal of public forces and of the national commission for protected natural areas from our lands, dispossessed since February 2011. We demand freedom for our political prisoners Juan Antonio Gómez Silvano, Mario Aguilar Silvano and Roberto Gómez Hernández and of the unjustly imprisoned compañeros Santiago Moreno Perez, Emilio Jimenez Gomez and Esteban Gomez Jimenez.